VS−44UHDA is a high−quality 4x4 matrix switcher for 4K@60Hz (4:2:0) HDMI signals and embedded/de−embedded analog audio. Fast and prompt delivery is very important to us. With the right information and request, we can deliver product nationwide within 24-48 hours, we want you to be 100% satisfied with our outstanding service. Product is available for immediate shipping from our warehouse, usually within 24 hours. Item is not yet shipping from our warehouse or from the manufacturer. We developed exclusive relationships with major manufacturers, therefore, please place your order today to ensure you will be one of the first to receive this item once it will be available for shipping. This product has been completely discontinued by the manufacturer and no longer available. Need a similar part? Please call 1.888.902.3309 , or email support@avprosupply.com. Temporarily out of stock but there are shipments on the way to re-stock our warehouses. Ordering an item that is currently on back order is a worry-free way to ensure that you will be first in line for the new inventory and that the item which you ordered will be sent out to you as soon as we receive it! VS−44UHDA is a high−quality 4x4 matrix switcher for 4K@60Hz (4:2:0) HDMI signals and embedded/de−embedded analog audio. 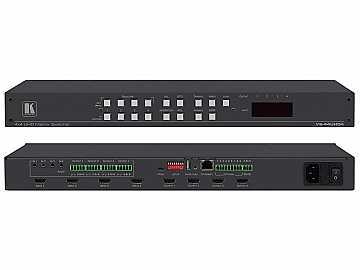 It reclocks and equalizes the signals and can route any one of four HDMI, HDCP−compliant sources (selectable) to any or all outputs simultaneously. The VS−44UHDA offers unmatched audio flexibility where any embedded digital or analog audio input can be routed to any embedded digital or analog audio output in addition to four ARC sources to produce an equivalent 12x12 audio matrix. Max. Data Rate — 8.91Gbps data rate (2.97Gbps per graphics channel). Max. Resolution — Up to 4K@60Hz UHD (4:2:0). Independent Audio Matrix — With ARC support. Audio Handling — Level & balance support with bass and treble adjustment. Kramer Step–in Over HDMI Technology. HDMI, HDCP and DVI Compliance. Selectable HDCP Off per Input. Memory Locations — Eight presets for quick access to common configurations. Advanced EDID Management per Input. Active Source & Acceptor Detection. Automatic Input Selection — Based on priority selection or last connected input. HDMI Support — Deep Color, 3D, ARC, up to 7.1 uncompressed audio channels. Kramer reKlocking™ and Equalization Technology — Rebuilds the digital signal to travel longer distances. Embedded Pattern Generator — With selectable patterns. Lock Button — To prevent tampering. Firmware Upgrade — Via mini USB, Ethernet or the RS–232 port. Control Options — RS–232 serial commands transmitted by a PC, touch screen system or other serial controller, Ethernet port via LAN, embedded Web pages via LAN for configuration and control. We offer free ground shipping on every purchase of $300 and more for US and US territory. Please choose "Free Ground Shipping (UPS/USPS)" option at checkout. UPS provides up-to-date tracking information. Ground service takes anywhere from 2-7 working days for delivery depending on destinations.UPS Ground does not deliver on Saturdays, Sundays or Holidays. USPS Priority Mail/USPS Express Mail For all shipments shipped via USPS, we offer 'DELIVERY CONFIRMATION' number with each package. Difference between tracking number provided by UPS vs USPS Delivery Confirmation number is: Delivery Confirmation status is updated when the delivery has been made or when the package has made it through major USPS stations. Air shipments, Overnight, 2nd day and 3 day select methods offer guaranteed delivery time for your shipment. If you are in hurry or in need for the items on schedule, select one of these methods. Up-to-date tracking information is provided with each Air Shipment. AVProSupply has the right to choose between Air shipments to meet or reduce delivery time. For guaranteed delivery of multiple items with expedited shipping, please contact our customer service representative for personalized assistance to get your items delivered to you when you need them. We offer shipping via USPS/UPS for our international customers. You can find different shipping options during checkout. Most items ordered from AVProSupply will be shipped out from our California Warehouse. Will-Calls are only allowed with Appointment Only - Please call Customer Service to set one up between the hours of 9am to 6pm PST. Major Credit Cards: Visa, MasterCard, Discover and American Express. Paypal: You can select an option of Paying with Paypal in our shopping cart. Money orders: and personal checks or company checks (may take up to 10 days to clear). Wire Transfer: ( Bank Transfer ) Only for the amount over $500. Contact us for the bank details. Phone Orders: To place a phone order please call 1.888.902.3309 or 1.916.246.6264 and one of our Customer Service Representatives will take your order (8:00am - 6.00pm PST). Our main goal is to ensure your complete satisfaction with our service and products. If, for any reason, you are not 100% satisfied with your purchase, you can return it within 30 days of the purchase date for a full refund. Our 30-day money back guarantee applies to all of the products we sell, except for: TVs and monitors 20" and larger, Special Order merchandise, or any item indicated as non-returnable. Shipping is not refundable. Prior to returning your purchase, a Return Merchandise Authorization (RMA) number will be provided to you. Refunds on returned items will be issued in the same payment form as received from the customer at the time of purchase. Once we receive the product and it passes inspection, we will credit your account. Please allow 3 - 6 business days for a credit to appear on your account. If the item was sent back to us for an exchange, please allow 3 - 5 business days for the replacement to be processed. We offer free ground shipping on every purchase of $300 and more for US and US territory. We deliver worldwide.